The game had a very big importance for second-ranked Magic as it allowed them to take a leadership position. 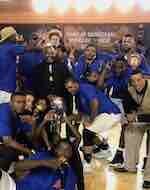 Magic smashed 6th ranked Marlins in Johannesburg 77-32. Magic have a solid four-game winning streak. As mentioned above they are alone now at the top position. Marlins at the other side keep the sixth place with two games lost. They share the position with Free State W.. Marlins will play next round against Limpopo Pride trying to get back on the winning streak. Magic will try to continue on its current victory against third ranked Mountaineers in Cape. The game in was also worth to mention about. 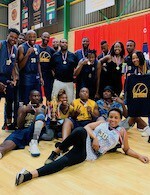 Fourth ranked Limpopo Pride (3-2) played at the court of 8th ranked Warriors (2-2). Limpopo Pride managed to secure a 5-point victory 64-59. Despite that victory Limpopo Pride went down to fifth position due to points difference. Warriors at the other side dropped to the sixth place with two games lost. They share the position with Kwazulu Marlins. Limpopo Pride will play against Marlins (#7) in Kwazulu in the next round. Warriors will play against N.C. Zebras and hope to get back on the winning track. Tshwane S. defeated Limpopo Pride in a road game 85-73. Mpumalanga R. was beaten by Free State W. at home 30-47. Kwazulu Marlins won against Mpumalanga R. on the opponent's court 78-66. We cannot really consider it an upset in the game between close teams when one of their biggest challengers Limpopo Pride (3-2) was defeated at home by fifth ranked Suns (3-1) 85-73. Suns have a solid three-game winning streak. They moved-up to fourth place. Limpopo Pride at the other side dropped to the fifth position with two games lost. Suns will have a break next round, and it should allow them to practice more before next game. Limpopo Pride will play on the road against Marlins (#7) in Kwazulu and it may be a tough game between close rivals. The game between closely ranked teams ended with eighth ranked Warriors' (2-2) road victory over 9th ranked Rhinos (1-6) 47-30. Warriors moved-up to sixth place, which they share with Kwazulu Marlins. Rhinos at the other side keep the ninth position with six games lost. Warriors will play against N.C. Zebras (#11) in the next round where they are favorite. Rhinos will play against E.C. Windbreakers and it may be a tough game between close rivals. Rather expected game in Mbombela where 9th ranked Rhinos (1-6) were defeated by sixth ranked Marlins (2-2) 78-66. Marlins maintains sixth position with 2-2 record, which they share with Free State W. Rhinos at the other side keep the ninth place with six games lost. Marlins will play against higher ranked Limpopo Pride (#5) in the next round and it may be quite challenging game. Rhinos will play against E.C. Windbreakers (#8) and it may be a tough game between close rivals.